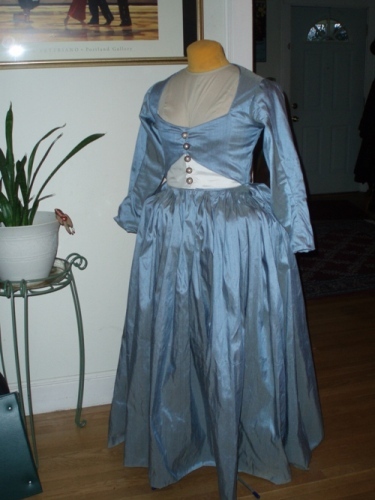 18th century, 1792 zone front gown made for PEERS Scarlet Pimpernel Ball. Inspiration was from a March 1792 print. 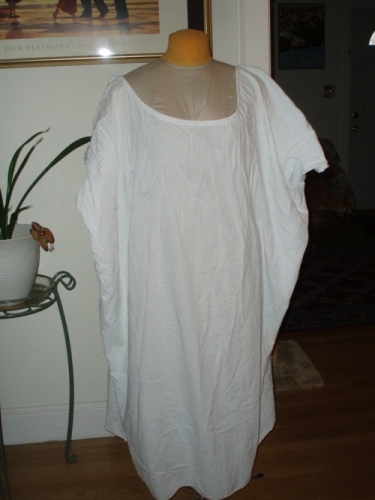 Cotton chemise, bias tape drawstring neck. 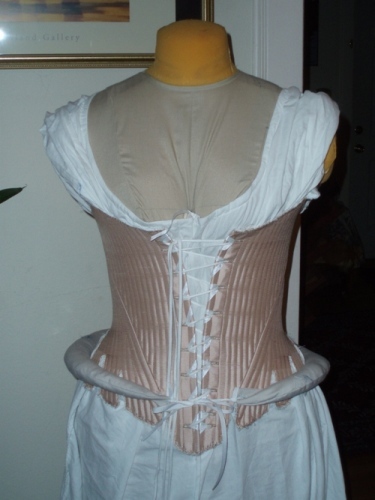 Double coutil, champagne silk on cotton, corset boned with oval/flat cane. 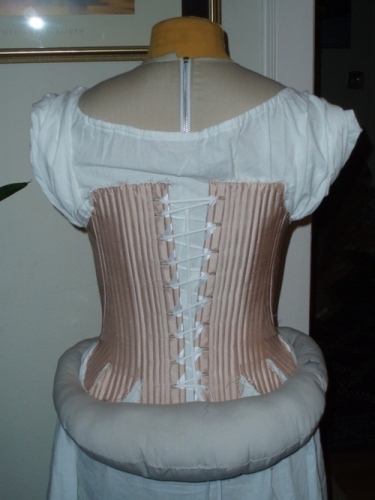 Front and back lacing edges have metal bones. 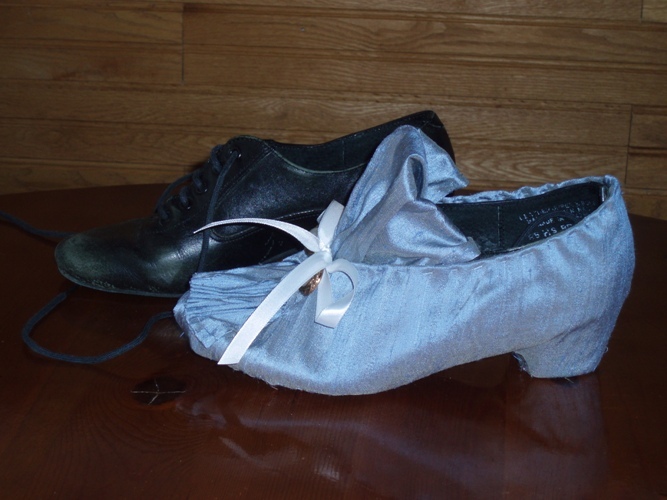 Buttonholes for straight lacing lined with polyester white ribbon. 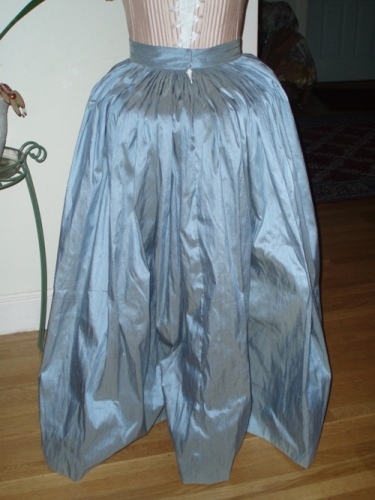 Blue home decorator silk cartridge pleated onto 2" waistband, 8" hem. 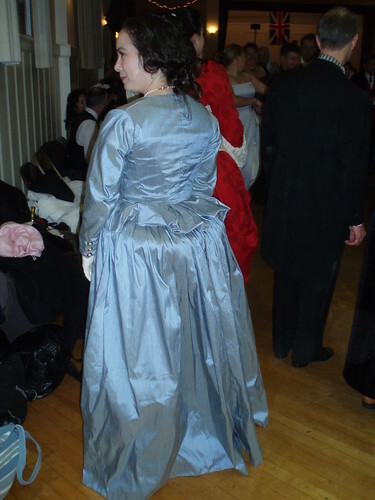 Deep pleat near back sides to simulate back overskirt. 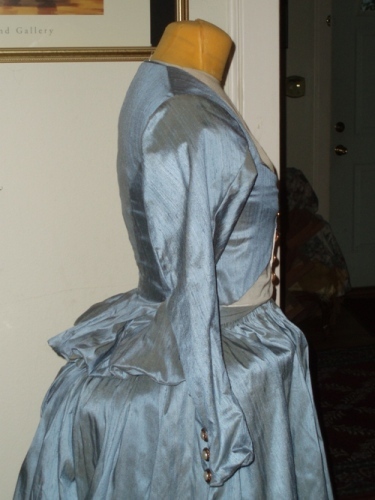 Blue home decorator silk bodice with back peplum, long sleeves. White silk front triangle area. Pearl-look and goldtone buttons down center and on sleeve cuffs. 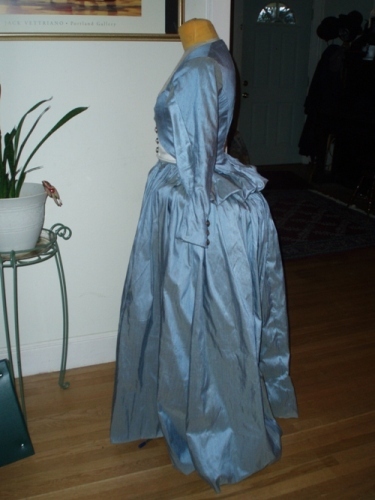 Gray twill lining bodice, white cotton interlining and gray polyester satin lining for sleeves. 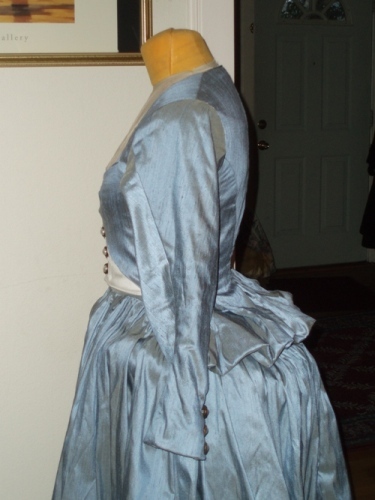 Pattern based on: internet image of 1790s pattern for a women's jacket from Karl Kohler's Kostumekunde. Drew pattern shapes directly on the twill lining without paper pattern or mockup. 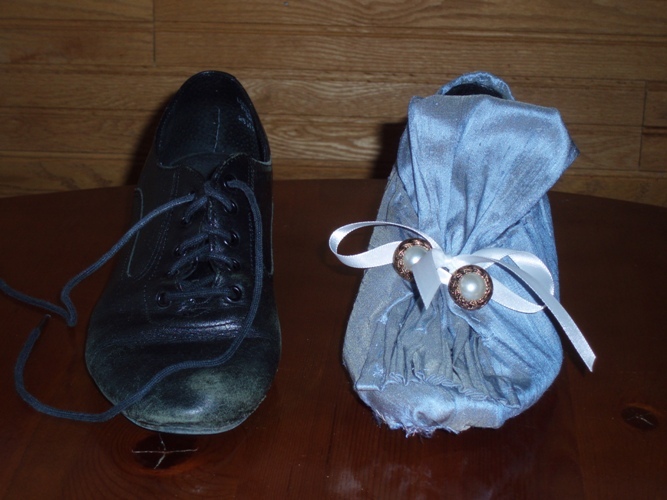 Old ballroom shoes covered to look like court shoes. 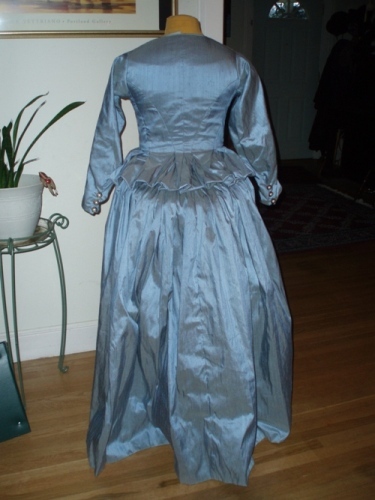 Blue home decorator silk, buttons, polyester white ribbon. Well, didn't quite get done as much as I wanted to. 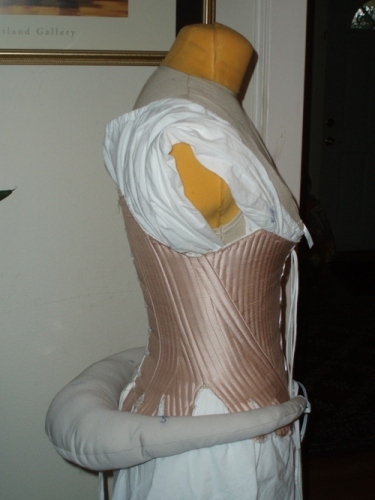 Not enough time to make another petticoat underneath to help soften the bumroll and keep the skirt from sinking inwards. 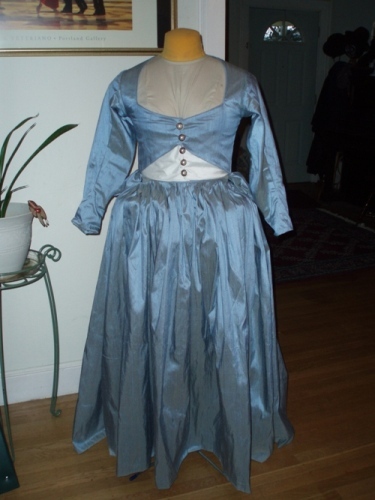 The chemise was basically a large rectangle with a neck hole, bias tape drawstring and sides sewn up but no sleeves. Only one shoe covered. 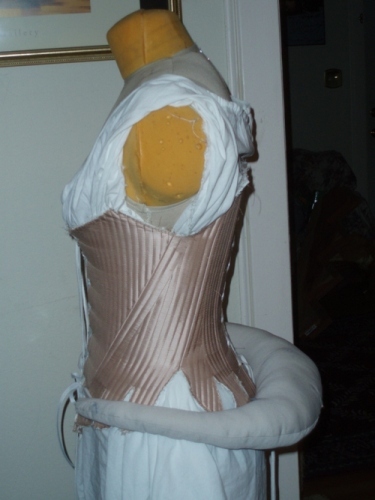 Add boning or try something to the front to prevent wrinkles. 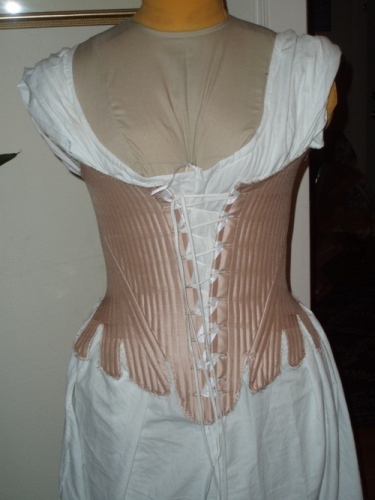 Unfortunately dress form doesn't curve quite the same way as I do with corset. 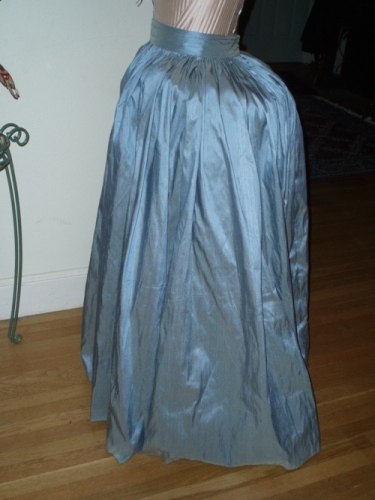 If dancing, may need to shorten skirt by 2". Was stepping on the back. 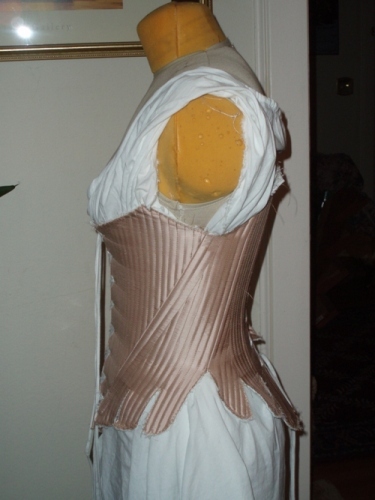 Reduce the width of the sleeves. I hate tearing apart and redoing things, but the undersleeve portion needs to be smaller. 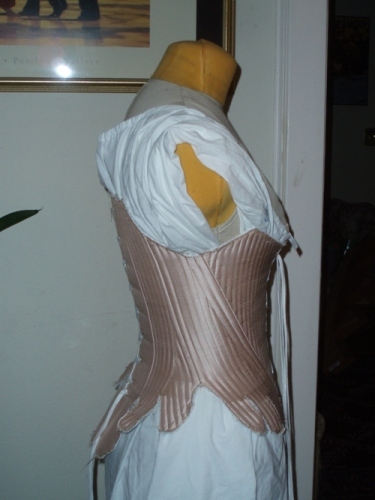 If the sleeve is reduced then another piece may need to be added to the bodice under the arms because the armhole would be reduced. Bleh. 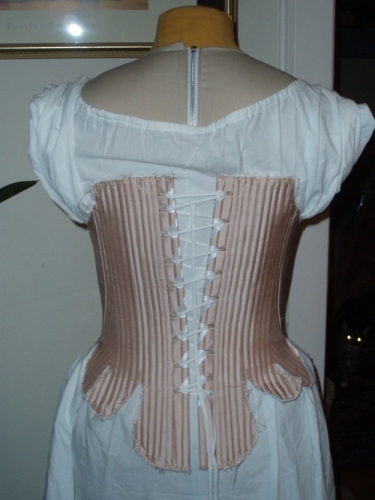 Finish chemise, possibly adding ruffles to the end that would show below sleeve. Haven't taken photos of all the pieces, yet. 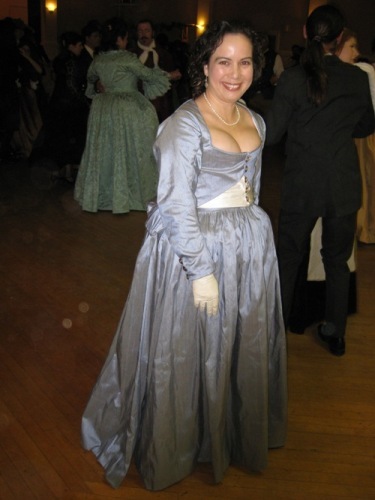 A couple photos from The Scarlet Pimpernel Ball. 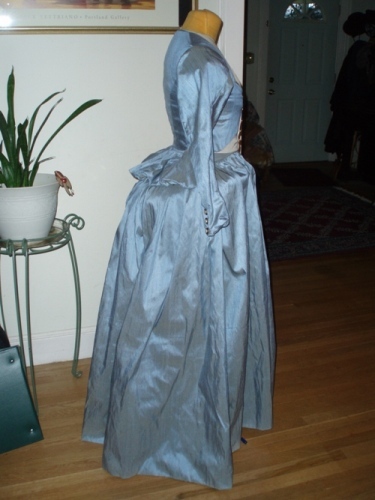 Started the Scarlet Pimpernel dress tonight. Not sure such a good idea as now I will try to finish it and there may not be enough time especially if I try it on at least once before going to the dance. 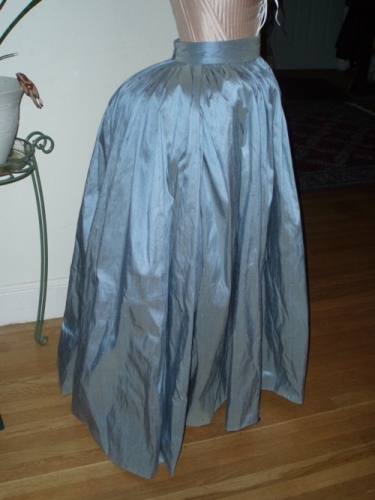 Used the full six yards for the skirt and do not look forward to hemming and pleating.